I have been a longtime reader of Robert Dugoni’s thrillers; I still remember when the first one, THE JURY MASTER, hit the New York Times bestseller list back in 2006. 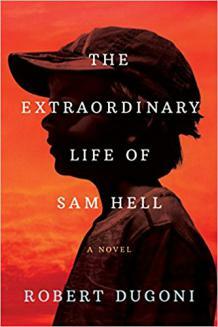 Somehow I missed his stand-alone title, THE EXTRAORDINARY LIFE OF SAM HELL, when it came out in April. I was happy to catch up on what he has called his “opus.” Just as William Kent Krueger deviated from his Cork O’Connor series with ORDINARY GRACE, here Dugoni takes his writing in a new direction with a beautifully crafted story of a life well-lived. As the book starts, Maddy Hill has just given birth to a son. Immediately they learn that he has challenges, as her husband Max reacts with shock. Samuel was born with a rare disease called ocular albinism, which causes one’s eyes to be red. Maddy pauses for maybe one second and then calls this news “God’s will,” deciding that Sam will have an extraordinary life. But for young Sam, as with many children, different is not what he wants to be. He would like to fit in, not stand out. School is a challenge as students at the Catholic school that he attends target him with bullying, while some of the nuns on the faculty are less than kind to him. And there is what I call a lead bully, David Bateman, who has chosen as his life’s path to make Sam’s life difficult. “Devil Boy” is a phrase that he hears again and again. His first friend is a new student, Ernie Cantwell, who is the only black child in the school --- another outsider. A girl, Mickie Kennedy, slides into the picture as well, who also walks to her own beat. Sam, Ernie and Mickie become the only friends who each other need. Upon leaving high school, they head in different directions, but the bond of friendship among them remains very real. While this is not one of the thrillers that Dugoni is known for, THE EXTRAORDINARY LIFE OF SAM HELL definitely has great pacing and structure, along with characters who you will want to cheer on. It is beautifully told with strands of coming of age, and has plenty of heart. For book groups, there is a lot to discuss; I can see people sharing their own growing-up stories as the discussion begins.